Every year here at 13th Dimension, I do something to celebrate Ben Cooper, the late, lamented purveyor of kitschy costumes that helped make Halloween so fun and exciting when we were kids. Even now, having long graduated to answering the door rather than knocking on it, I miss those goofy nylon jumpsuits and the plastic masks that that would make your face sweat, even when the temperature would drop to about 50 degrees at nightfall. Anyway, Ben Cooper looms large in TwoMorrows’ RetroFan #2, which makes sense since it’s a Halloween issue. Editor Michael Eury interviewed Ira Cooper — the son of company co-founder Nat Cooper — and we’ve got an EXCLUSIVE EXCERPT for you. Ira Cooper, who himself worked for Ben Cooper Inc. and who’s working on an illustrated history of the family biz, talks about the company’s origins, discusses the infamous warning written on Superman costumes – and debunks a favorite fan myth about whether Ben Cooper Inc. actually invented Spider-Man before Lee, Ditko and co.
RetroFan: How did brothers Ben and Nat Cooper segue from being costumers for the New York stage to the Halloween costume business? Ira Cooper: Nat said that they figured out that they could not keep making one costume at a time and complained, “Taking the train to Chicago every time an actress busted a seam…”. 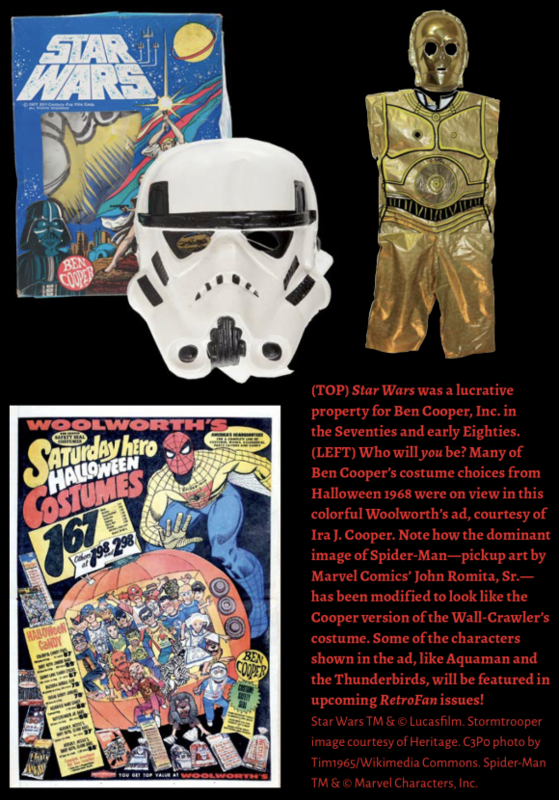 RetroFan: Why did the family business take Ben’s name instead of being, say, Cooper Costumes? Cooper: Ben had a son (Bobby Cooper) before the war (WWII) and so he had a deferment. Nat had been a salesman while they both worked in and around the custom costume business, but volunteered for OCS (Officer Candidate School) thinking that he would otherwise, as a single man, be drafted into the infantry. He figured his chances were better as an officer—and he had a college degree from St. John’s in New York City. Ben started the official corporation in his absence and Nat joined it shortly after his return from Europe at the end of the war. 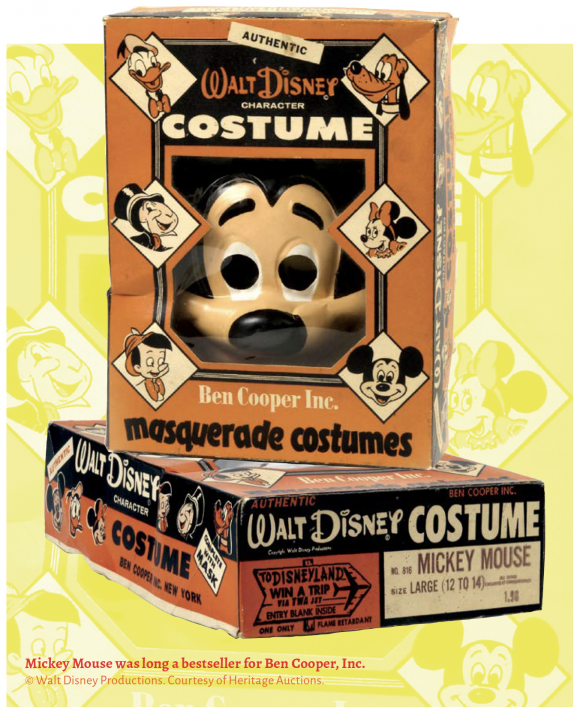 RetroFan: It’s been reported that in 1937 Nat Cooper ventured from the company’s Brooklyn headquarters to Hollywood to meet with the Disney company to negotiate Ben Cooper Inc.’s first licensing deal, for Mickey Mouse. Did Nat have a prototype in hand? What anecdotes can you share about this monumental meeting? Cooper: I do not have any stories about this, and I am not so sure about this “lore” as described here. I believe that they had an early Disney license, and as near-contemporaries of Walt they worked with him at times. But I think they got the license for playsuits (more expensive department store goods) upon acquiring the Playmaster Corporation. Their first foray to Los Angeles to see Disney about an original product was likely after the war in order to secure the license for inexpensive Halloween costumes. Trips to Disney before that were no doubt to create a business relationship and to get approval for various new designs. RetroFan: After Disney, what was Ben Cooper Inc.’s next big licensing score? Cooper: It was actually more Disney, because although Mickey was popular, he evolved as to his looks so that he became more and more kid friendly. This required a risk of capital. Snow White was next, and the prospect of success was not necessarily optimistic. But like Walt, Ben and Nat saw the value in the sheer quality of what Disney was producing and so they risked it. Ensuing licenses ran the gamut from Looney Tunes to Universal Monsters to the eventual rise of Superman. RetroFan: How long did it usually take for a costume’s development, from sketch to production? Cooper: Nine months if there was no rush, six months rushed, and three months if it was a major new property with potential right away. The process involved artists, sculptors, engineers, fabric production, pattern cutting, etc. Samples and art were often hand-carried to the various artists and sculptors in the area of the Brooklyn factory. It could take weeks to sculpt a mask to Ben’s liking. Nothing was accepted without finessing the design, execution, and fit. RetroFan: In the ’50s, Ben Cooper Inc. produced Superman costumes and capes, during the heyday of TV’s Adventures of Superman, starring George Reeves. How many of these were sold during that time? Cooper: I do not know the volume, but Superman approached Mickey Mouse in volume—but not overall, as Mickey sold to a wider age range of kids than we see today for superheroes. In those days, Superman was strictly for boys ages eight and up. RetroFan: Did the company ever face any negative publicity from incidents where children injured themselves when trying to fly while wearing a Superman cape? RetroFan: The smell of Ben Cooper Halloween masks provides a vivid memory for kids who wore them. What were the masks made of? Cooper: “Virgin vinyl” was how it was described, virgin being important as it did not have any other coatings or paints on it that might have been unsafe. Lead was not known to be an issue, but material that went through various factories and handling was simply not clean enough for the paint. I think they would be considered PVC, but my understanding is that PVC itself changed over time. RetroFan: Who were some of the standout costume artists who worked for Ben Cooper? Cooper: Ben did not hire a lot of artists. There were two who held long-term jobs with him: Henry Porter, who went on to become an African-American artist of note, and Frank Romano, who was with the company for many decades and is the one responsible, along with Ben’s specific direction, for the look of the Ben Cooper line and the interpretation of the licenses from the late ’50s on. Frank is in his 90s and still active, still painting. I am working with his family to reproduce some of his original art. 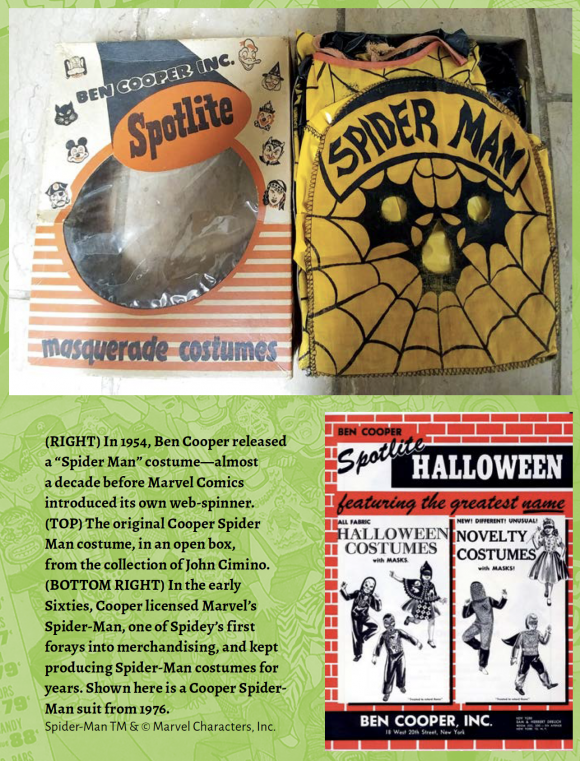 RetroFan: Ben Cooper Inc. created a “Spider Man” Halloween costume in 1954, eight years before Marvel Comics’ Spider-Man premiered. There’s been conjecture among some comics fans that someone at Marvel might have drawn “inspiration” from Cooper’s costume. What’s your take on this? Cooper: This was nearly all Nat—something for which he rarely gets the credit—although it was Ben who saw it, let’s say, concomitantly, and turned the comic and cartoon art into Halloween art that kids would want to wear. But it was Nat who pushed it, as he was directly connected to the growing world of comics and TV cartoons (which he monitored in great detail). RetroFan: The company’s major licensing coup of the ’70s was Star Wars, one of the first merchandising deals struck for the property—before anyone could anticipate its wild success. Tell me about the demand for Star Wars costumes for Halloween 1977 and how the company managed to meet it. Cooper: This will be in my book in more detail, but it was a whirlwind effort of 24-hour production. Bobby Cooper was, in my estimation, very instrumental in this success. RetroFan: What differentiated Ben Cooper’s Halloween costumes from Collegeville’s and other competitors? Cooper: The quality of art, the costume fit, and finish. Ben was a perfectionist and would miss production dates to perfect some of the smallest details if Nat and later, Bob would let him! RetroFan: Were there any costume licenses that Ben Cooper Inc. attempted to acquire but lost to a competitor? Cooper: Universal Monsters and Looney Tunes tumbled between Ben Cooper and Collegeville. Peanuts was unobtainable once Collegeville had it. Jaws was a miss and went to Collegeville. Bland Charnas Company had one or two. But Nat was a master at reading the “tea leaves” of cartoon/TV and comic production. Movies, except for Star Wars, rarely created merchandising successes until the ’70s—and even then it was spotty. RetroFan: Of Ben Cooper’s many costumes—from original characters to licensed characters— what’s your personal favorite (or favorites, if it’s impossible to single out one)? Cooper: Rusty from Rin Tin Tin. Then I got a little older and it was Zorro, but then, from about age 8 on, I wore Superman exclusively. RetroFan: What is it about Ben Cooper Halloween masks and costumes that has fascinated fans for several generations? Cooper: The quality of Ben (Cooper’s) and Frank Romano’s art and the anticipatory nature of Nat, and to some degree Bobby Cooper’s understanding of a growing fascination with licensed characters and the venues in which they were shown, marketed, and merchandised. — The Endless Joy of Superhero VIEW-MASTERS (From RetroFan #2). Click here. — The Greatest BATMAN Costume a Boy Could Have. Click here. RetroFan #2 is available now at comics shops, online retailers or directly through TwoMorrows. Click here. I so wanted the BATMAN suit. Even at that age, I knew the logo on the forehead didn’t belong but, I didn’t care. I still wanted that for one Halloween. Our local Ben Franklin 5 and Dime store didn’t have it. My dad came home with a Mr. Spock instead. I have pictures of me with my Ben Cooper Batman mask from 1966 and me in the Superman outfit in 1967 that I got for my 9th birthday. Great memories! Great issue of Retro Fan! I highly recommend everyone pick it up, especially before Halloween. Even as a kid, Ben Cooper’s inconsistencies bothered me, but I wore them anyway. I still have my vintage cloth Batman playsuit from the 70s! It doesn’t fit any more, though.